INDIANAPOLIS (October 27, 2015) – Taskstream, the leading provider of assessment and e-portfolio technology to improve student learning and institutional quality in higher education, introduced its latest product offering – Aqua by Taskstream™ at the 2015 Assessment Institute in Indianapolis. Prior to today’s announcement, Aqua was used as the technology behind the Multi-State Collaborative (MSC) to Advance Learning Outcomes Assessment pilot study, an initiative led by AAC&U and SHEEO with funding from the Gates Foundation. With Aqua, Taskstream aims to provide institutions with a dramatically simpler path to learning outcomes data resulting from the direct assessment of student work, in order to make it easier for institutions to focus on student learning and engage faculty in meaningful conversations about improvement. 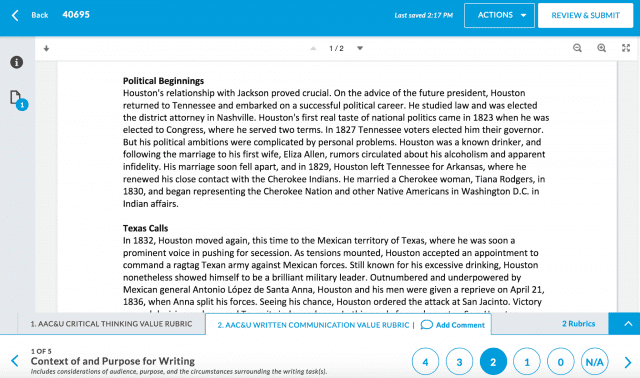 Aqua offers multiple options for collecting student work, streamlined interfaces for scoring the work with rubrics, and visual reports to see how students are performing based on data in real time. Aqua has already been proven to be easy to use for faculty and to produce actionable data quickly through its use for the MSC pilot study. In a post-study survey about the technology, the feedback from participants was overwhelmingly positive. In fact, 97% of scorers who responded found the technology to be “easy” or “very easy” to use. Aqua will continue serving the MSC project as it expands to include more states and institutions across the country. A number of colleges and universities have already started adopting Aqua. The Multi-State Collaborative to Advance Learning Outcomes Assessment, led by AAC&U and SHEEO with funding from the Gates Foundation, uses Aqua to collect student artifacts from two- and four-year institutions in 9 states and distribute the work to faculty for scoring using the AAC&U VALUE rubrics. Aqua by Taskstream provides institutions with access to real-time data on student learning outcomes through visual reports.